Sound Sleep Patch - Get the Best Sleep Tonight with The Sleep Patch. All-natural supplements. No fillers or preservatives. No artificial colors or sweeteners. Enhance overall sleep quality. Improve morning alertness. Reduce daytime fatigue. Just put on a patch and go. Better absorption than pills. No mess, no fuss, no hassles. 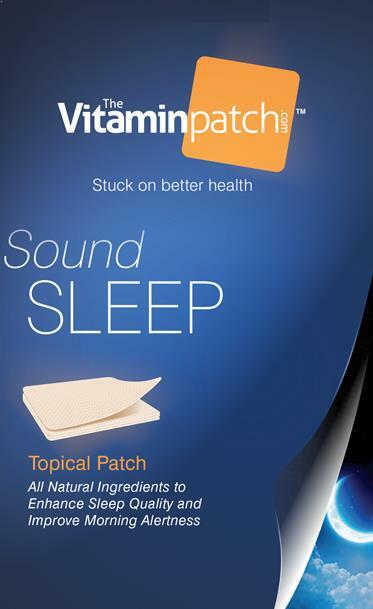 The Sound Sleep Patch contains a synergistic blend of all natural ingredients that helps you to fall asleep more quickly, enhance overall sleep quality, improve morning alertness, and reduce daytime fatigue. Vitamin B6 in the form pyridoxal 5′-phosphate, is an important cofactor in serotonin synthesis, a neurotransmitter that has an important role in sleep. Serotonin is then converted to Melatonin which helps control your sleep and wake cycles. Magnesium is a major factor in relaxing the smooth muscles within the blood vessels, and affects circulating levels of norepinephrine and the synthesis of serotonin and nitric oxide. Lemon Balm Extract has been used medicinally for centuries to address sleep disturbances, including restlessness and insomnia, reduce anxiety and promote a sense of calm and relaxation. 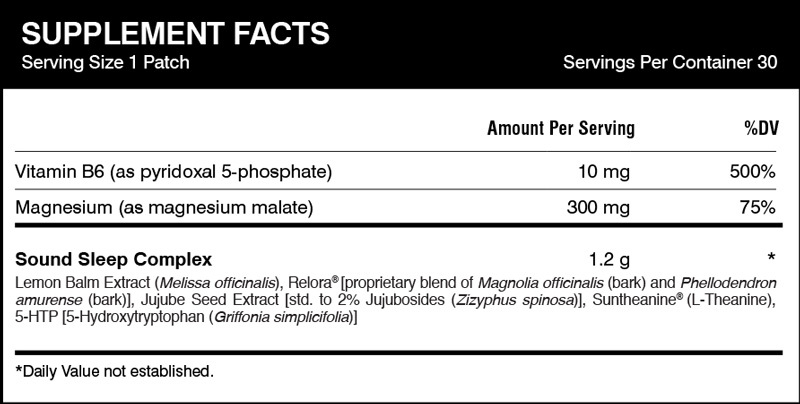 Relora®, a proprietary blend of Magnolia officinalis and Phellodendron amurense, helps to balance the HPA axis (hypothalamic-pituitary-adrenal axis), which is a central hormone pathway of the body. By balancing the HPA axis, Relora® helps promote healthy levels of stress hormones, healthy sleep and energy levels. Jujube Seed Extract has been shown to support individuals with an overactive mind to get a restful night of sleep by helping to calm the central nervous system. Suntheanine® (L-Theanine) in clinical studies have shown to induce a sense of calm in patients with anxiety and sleep disorders. L-Theanine does not act as a sedative, but it does significantly improve sleep quality. 5-HTP (5-Hydroxytryptophan), is an intermediate in the natural conversion of the essential amino acid, tryptophan, to serotonin. Clinical studies have shown that 5-HTP increases the amount and availability of serotonin produced by the body. Increased brain serotonin levels may produce positive effects on emotional well-being, appetite regulation, melatonin production and maintaining a healthy sleep cycle. This information has not been evaluated or approved by the FDA and is not necessarily based on scientific evidence from any source. These statements have not been evaluated by the Food and Drug Administration (FDA). These products intend to support general wellbeing and do not in-tend to treat, diagnose, mitigate, prevent, or cure any condition or disease.